Great new news hot off the press! 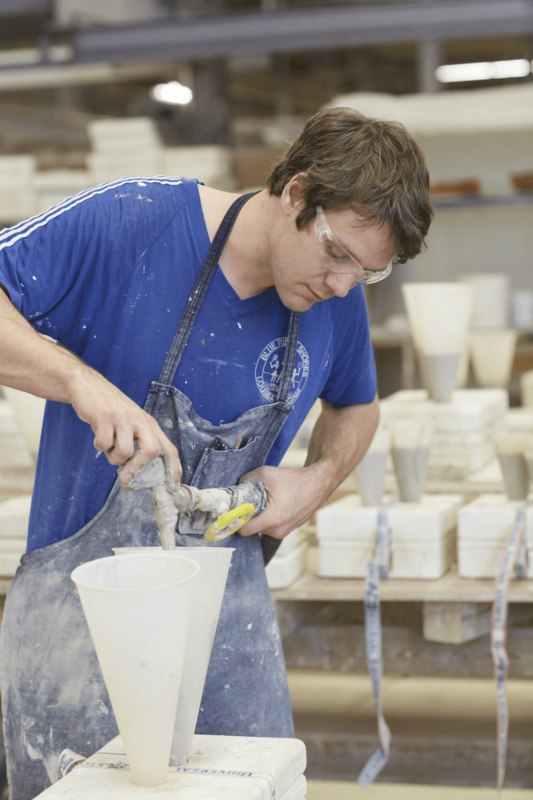 NCECA has partnered with the John Michael Kohler Arts Center’s Arts/Industry residency program to offer a 2-3 month ceramics residency for one Emerging Artist applicant! This opportunity arose from the concurrent timing of our 2014 conference in Milwaukee, WI and the Arts Center’s 40th anniversary for their Arts/Industry residency program in Sheboygen, WI. What better way to celebrate than to bring our organizations together and create this amazing opportunity for the best and brightest in our field! 2013 Arts/Industry artist Ian Henderson. Photo courtesy of the John Michael Kohler Arts Center. The application for the Arts Center’s Arts/Industry residency will be incorporated into the Emerging Artist application. All 2014 Emerging Artist applicants are eligible but must indicate on the application form if they want to be considered for this opportunity. A 250-word (or less) project proposal will be required so you can begin thinking about that now. The John Michael Kohler Arts Center will make the final selection, and their selection process is independent of NCECA’s Emerging Artist selection process. This means that while one may not be selected as an NCECA Emerging Artist, one could still be selected by the Arts Center for this residency. The lucky artist selected for this honor will do a 2-3 month residency during 2014, which will be coordinated between the artist and the Arts Center. The Arts Center will provide housing, studio space with 24-hour access, materials, firing, technical assistance and a modest weekly stipend for food. NCECA will provide up to $1500 to defer costs for traveling and shipping expenses. We’re so happy to have The John Michael Kohler Arts Center on board for this partnership during their milestone year and our 2014 NCECA conference in Milwaukee. This is a golden opportunity for our NCECA Emerging Artist applicants and one that is not to be missed! Would love to submit for this opportunity! Where and how do I sign up? All of the details, including a link to the submission form are here: http://www.nceca.net/static/exhibitions_emerging_info.php Good luck!